1(6 pound) whole chicken that has been cleaned and patted dry. First, make your dry rub and then set aside. Next, remove giblets from the chicken, then wash it thoroughly(don't forget to clean the inside as well). Generously coat the chicken with the dry rub. Then, add some softened underneath the skin. Once done, salt and pepper the cavity and then add in your garlic and lemongrass. Take some kitchen twine and securely tie the legs together. Allow the chicken to rest overnight. Take your chicken out of the fridge and allow it to come to room temp. Next, take your celery and carrots and place them into your roasting pan. Drizzle in some olive oil and season with salt and pepper. Do the same with the baby potatoes or use a package of roasted potato seasoning like I did in the video. Put your chicken directly on top of all the veggies and bake in the oven for 1 1/2 hours or until internal temp reaches 165 degrees. You may tent the chicken with foil if it gets too dark looking for you. Let chicken rest for 30 minutes before cutting into it. Remove the veggies from roasting pan and pour the liquid/drippings from the pan into a fat separator or measuring cup and scoop out most of the fat. Add in some chicken broth to make a total of 2 cups. Set aside. On medium high heat, add in 3 Tbsp of butter into a hot, cast iron skillet. Turn the heat down to medium and cook until butter has completely melted. Then, add in 3 Tbsp of sifted flour and continue to whisk until smooth. Once it has started to turn color, slowly pour in your reserved drippings/chicken broth mix and continue to whisk. Add in some salt, pepper, and sugar, and taste check as you go along. Continue to cook until gravy has thickened, about 15 minutes or so. Transfer to gravy bowl. 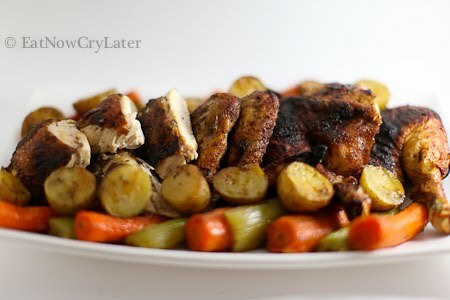 Cut up your chicken and place on a platter along with your roasted veggies and homemade gravy!! YUMMY!! Add 2 Tbsp of olive oil into a hot cast iron skillet. Add in your onions, a pinch of salt, and 1 Tbsp of brown sugar. Turn heat down to medium low and continue to cook until browned, stirring constantly. After about 10 minutes, add in your cut grapes, 1 Tbsp of unsalted butter,1 Tbsp of brown sugar, another pinch of salt, and 1 Tbsp of water. Continue to cook for another 5 minutes or so and take off heat and allow to cool slightly. Next, make your brown sugar paste and set aside. Carefully, unfold your phyllo dough and place it on a piece of parchment paper, set on a cookie sheet. Take a pastry brush, and carefully brush on some melted butter. 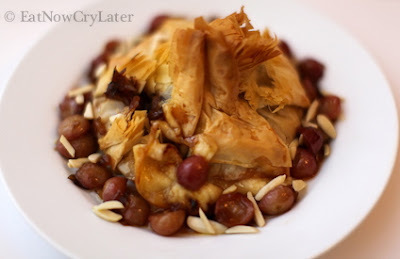 Repeat with the remaining 5 sheets of phyllo. You may use butter for all 6 layers but I like to use butter flavored cooking spray for the remaining sheets. Take 1/2 of the brie and place it in the center of the phyllo sheets. Add the brown sugar paste(make sure you stir it first) and then place the other half of the brie on top, followed by the grape and caramelized onion mixture(make sure to reserve some for garnish). Finally, bring all corners of the phyllo dough together, and scrunch it together lightly, to seal. Spray with more baking spray or melted butter. Bake in 350 degree for 25-30 minutes or until golden brown. Remove from oven and garnish with leftover grape and onion mixture. Top with toasted almond slices and plate with crackers of your choice. Serve immediately. Put your prawns in a mixing bowl and add in your fish sauce, black pepper, sugar, msg(if using), and cornstarch. Mix to combine and set aside. In a hot skillet set over medium heat, pour in some peanut oil. Add in your onions, a pinch of salt, and cook until translucent. Next, add in your garlic and cook for 15 seconds(or until you can smell the garlic). Then, throw in your prawns and mushrooms and cook until the prawns turn slightly pink. Turn up the heat slightly to get a good simmer. Add in your chopped green onions and oyster sauce. 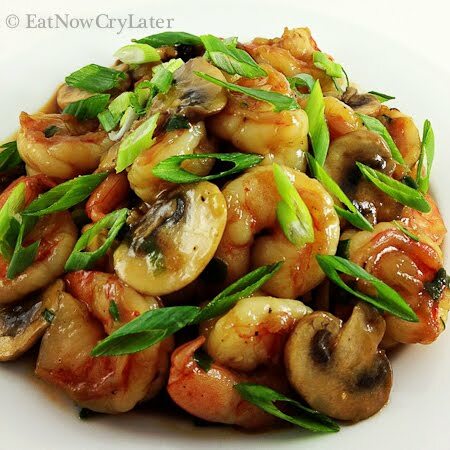 Stir and cook until shrimp is done but be careful not to overcook. Taste check and adjust seasoning as needed. Turn off and remove from heat. Drizzle on 1 Tbsp of OMG sun dried tomato oil. Serve immediately with white rice.